Home to Europe’s first ever National Marine Park and one of Spain’s most popular dive sites. With viz up to 30m and water temperatures topping 29°C: It’s the perfect spot to take in a leisurely holiday dive. Whether diving the quiet sheltered coves of Marina del Este or from the white sand nudist beach of Cantarriján, the Costa Tropical has a number of protected bays to satisfy both beginner divers or the more experienced and allows year round diving too. Lying at the foot of the Sierra Nevada mountain range, this rocky shoreline offers a rich heritage of ecological wonder and hosts a profusion of multi-coloured marine species. Marine life regularly encountered includes octopus, conger and moray eels, lobster, grouper, weaverfish, moonfish, damsels, wrasse, scorpionfish, dolphins, nudibranchs, together with a variety of faunas and corals. La Huerta (7-18m) The widest area of Cerro Gordo, giving four or five different dive options. Shallow with a lot of fauna and light, numerous crevices to investigate and with magnificent spirogyra. Cerro Gordo (7-18m) Made up of large stone blocks at the foot of the cliffs, the fauna is very well conserved thanks, in part, to the protection afforded by its inclusion in the nature reserve since 1989. La Cueva de Cerro Gordo (16m) A short five metre swim will bring to you a cavern lit by a hole in the ceiling. The cave system beyond is for cave-divers only; it is fed by freshwater and the visibility is fantastic. After about a distance of 80 metres, you can surface in an enclosed cavern of fresh water. This dive is for Advanced and Cavern divers only, accompanied by one of our PADI Instructors. Playa de La Herradura (3-12m) A gentle shore entry will allow you to explore the shallow reef along the bay’s east wall. 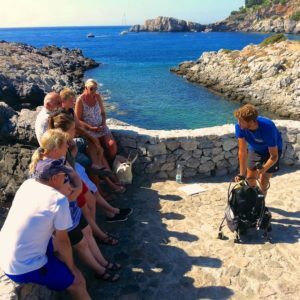 It’s the perfect site for a PADI Discover Scuba Diving session and has played host to hundreds of Simply Diving students’ first taste of the underwater realm. Expect to come across octopus, cuttlefish, brittlestars and the occasional sand eel. Punta de la Mona (12-40m+) On the underwater projection of Punta de la Mona, depths at this site reach up to 52 metres. Encounters with sea bass and Ocean Sunfish are common. At depths of 35 metres there is one of the few existing yellow coral fields. Tres Picos (6-19m) Three large pinnacles emerge from the seabed giving this site its name of Three Peaks. Start the dive over a 6m deep reef before plunging down the wall face covered in bright orange star coral. The rocky surfaces and many crevices are full of life. Look out for a couple of very cool swimthroughs too. Los Gigantes (10-30m) From around ten metres a steep bank drops down to a depth of between 25 and 30 metres. Octopus and Ocean Sunfish are frequently seen, while for macro-photographers there’s a wide variety of nudibranchs. Las Piedras Altas (20-40m) Two rocky formations emerge from 30 and 18 metres. An extensive and extremely uneven relief zone offers the opportunity to encounter large fish such as sea bass. Fraggle Rock (16-24m) An underwater seamount providing an interesting dive, with the depth increasing as you move around it. A good site to observe scorpionfish and nudibranchs. A short distance away from the rock is a small fishing boat at a depth of 27 metres, as well as two parked cars that have become regular cleaning stations for juvenile Ocean Sunfish. Marina Bay (8-30m) This is a wide area with different dive options, catering for all levels of experience. One route involves following the cliff wall, which forms the eastern part of Punta de la Mona – huge rocks protrude from the cliff face, providing a maze of large crevices. Of particular interest are the benthic fauna on the vertical walls, where sponges and soft corals show off their colours. Hundreds of divers have been certified by Simply Diving in the bay due to its perfect year round conditions and topography. Seahorses are beginning to be spotted on a more regular basis and schools of damselfish, anthias and wrasse will keep any diver busy.